Stop the New Swedish Education Law! 2. Homeschooling and the European "Third Way"
4. Child's Right, or State's Right? Where is Homeschooling Legal in the EU? You Don't Like School? You're a PsYcHo! Allmänintresse eller våld på en mänsklig rättighet? Nu får du faktiskt lyssna, Björklund! Regeringen - statlig tjänst eller Storebror? Sluta slå på Sveriges föräldrar! Sweden - The Next Germany for Homeschoolers? Trebarnspappan Jonas: "Vi hemundervisar våra barn"
Vill Mona Sahlin avskaffa friskolorna? Är en båt viktigare än barnen? Är Sverige en familjepolitisk sovjetstat? 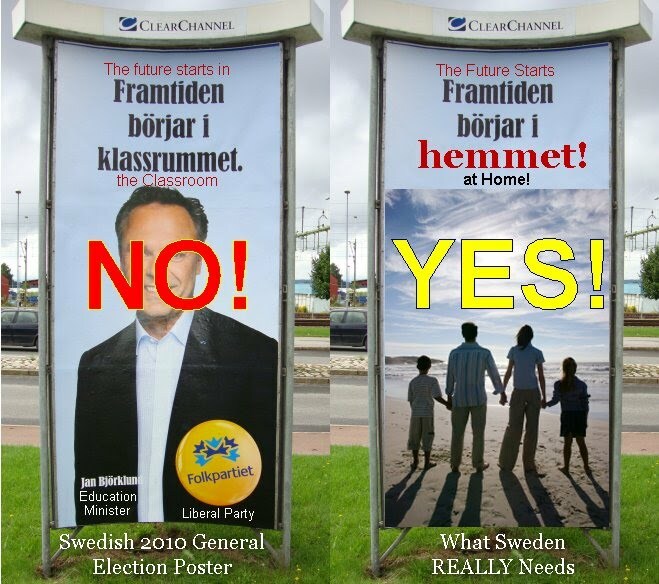 Is Sweden a Soviet State in its Family Politics? 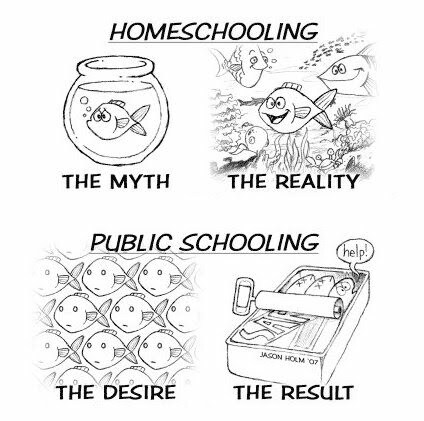 Home-Based Education: Not "Does It Work?" but "Why Does It Work So Well?" Will Schools Ever be Free from the Chains of State Control? Read About the Shocking Arrest of State-Kidnapped Domenic Johansson's Father for Taking His Son to Visit His Grandparents! Welcome to the New Swedish Gulag! Sweden Outlawed It's First Human Right on 22 June 2010 and thanks to its misguided government is now a criminal state. Not only that , the re-elected Government now wants to make State Kindergarten compulsory for every child from the age of 3 years old! They want TOTAL CONTROL! 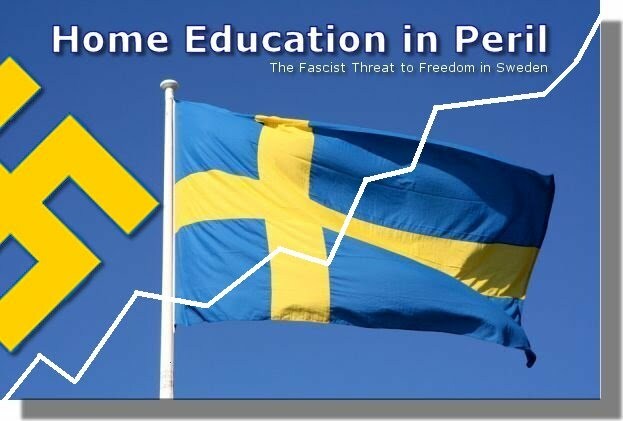 22 June 2010 - The Swedish Parliament voted to make Homeschooling illegal by arrogantly voting out of existence a fundamental Human Right recognised by the European Union and United Nations SWEDEN HAS NOW TAKEN A MAJOR LEAP INTO THE DARK ABYSS OF TOTALITARIANISM ...AGAIN! 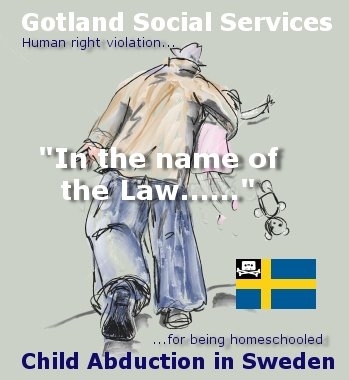 From this day on the Swedish Government will face law suits, every action involving homeschoolers, municipalities and the courts will be documented, translated to English, and made available to the U.N, international media and to support groups everywhere through ROHUS and websites like this one. We will not surrender our fundamental rights! Homeschooling is a Human Right protected by the European Constitution and by the United Nations Charter on Human Rights. Read the Deposition of the Johansson Family to the European Court of Human Rights for the state kidnapping of their son, Domenic. 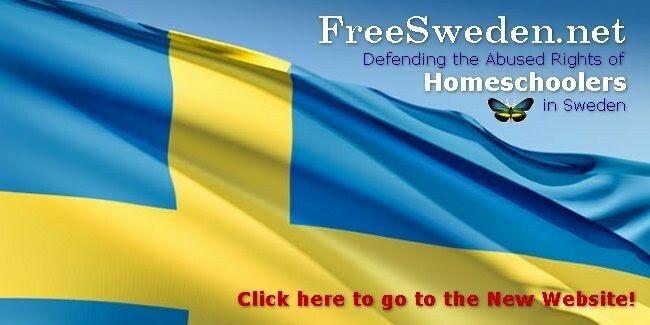 WE ASK HOMESCHOOLERS AND HUMAN RIGHTS ACTIVISTS OF THE WORLD TO SUPPORT US IN THE BATTLES AHEAD! THE SWEDISH ÉLITE'S LOVE-AFFAIR WITH GERMAN TOTALITARIANISM (NAZI AND COMMUNIST) MUST END! and consequently in social and economic stagnation"
Scheller's Way: Conform and Be Content...or Else Letter to Gotland Municipality - Dominic Johansson Britain Says NO to Homeschooling Regulation! Child's Right or State's Right? A People Crying out for Emancipation from Statism and a Dangerous Totaltarian Mindset! - Kidnapped by ARMED POLICE and put into state "care" because he was being homeschooled! "Jan Björklund (utbildningsminister) har en intressant abrovink liberal syn på pedagogik. Den kan i det närmaste beskrivas i orden, vi vill ha många friskolor och många alternativ, så länge de lär ut exakt samma sak och på samma sätt." Feel free to copy-and-paste this front page to your Blog! into a crescendo of tyrrany. and what happens in Europe will be imitated by the world. Lovers of liberty the world over: unite and make your voice heard!"